Your engagement ring may very well be the first piece of fine jewelry you own. After the initial excitement of being engaged winds down, you suddenly realize you're now responsible for a pretty valuable piece of jewelry. One that you need to care for every. single. day. Start with these time-based checklists. If you do each of these things at the frequency noted, you're very likely to have a diamond that really does last forever. Store in a separate, fabric pouch or section of your jewelry box. One of the most common ways jewelry is damaged is being scratched by other jewelry. Have a safe, memorable location available to place your jewelry. Even when you're on-the-go, always know where you can safely store your ring if you need to remove it. Watch for warning signs of vulnerabilities in your jewelry. Know how to spot a loose stone. There are six major signals that your jewelry's about to break. Place your ring in a designated spot while showering. All those soaps and shampoos will cause buildup on your ring. Plus, fishing a ring out of the drain is never fun! Wipe down with a dry jewelry cleaning cloth. Need your very own jewelry cleaning cloth? Ask your jeweler or let us know! A light cleaning using a safe, homemade jewelry cleaner. Your own sweat and body oils can dull the shine of your jewelry. DIY cleaning calls for warm, soapy water and a toothbrush. It's easy to lose a piece of jewelry or individual stones if you're not giving your jewelry regular check-ups. Your jeweler will deep clean your pieces for brilliant shine, too! Two times per year is best. And make sure you fully understand your coverage. If your jewelry's value has decreased, you could be spending more than necessary to insure your piece. 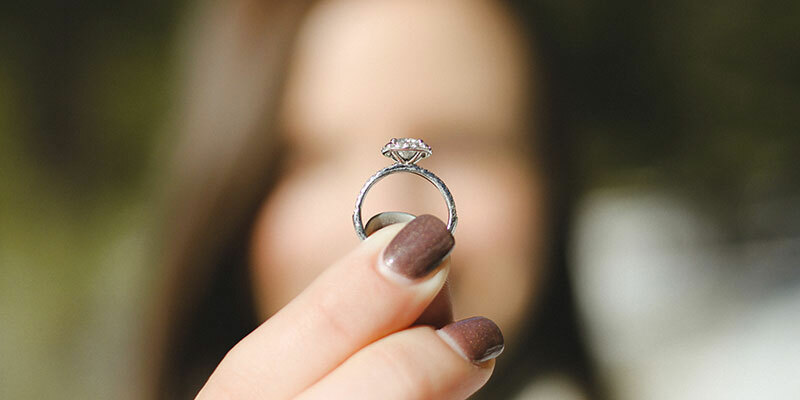 Or, the reverse could mean you're underinsured and may incur additional out-of-pocket expenses to repair or replace jewelry that becomes damaged or lost. Getting a new appraisal every 2-3 years is sufficient. Clean your jewelry with bleach, abrasives or toothpaste. Strong chemicals like bleach can discolor precious metals, and abrasives like toothpaste and baking soda can scratch softer stones and metals. Pick your ring up by the stone. The less often you handle your ring, the better, especially the center stone. Put your jewelry in a storage unit. Rent a safety deposit box at your bank if you're moving or need to store your jewelry away from your home for an extended period. Dirt and small rocks are abrasive. If not cleaned right away, your jewelry can be permanently damaged. Beware the dangers of gardening gloves too. Bleach and other heavy duty cleaners can wear away at precious metals. Any exercise that requires you to hold something, like dumbbells, a tennis racket or golf clubs, is a jewelry wearing no-no. Sweat in general can also be damaging to sterling silver. Salt water and chlorine can damage your jewelry. Chlorine can discolor metals (like gold and platinum) and can slowly erode the finish and polish of gemstones. It can even corrode your prongs enough for them to break off entirely. Plus, the cold water could make your fingers constrict, causing the ring to become loose and fall off. Things get messy in the kitchen. Take off your ring to avoid coating it with sauce or nicking it with a knife. Lotion can get into the crevices of chains and prongs, and both lotions and sprays create a film on your jewelry, making it dull and dingy. While these lists may seem to add up to quite a few tasks to remember, it's really all about habits. Make it a habit to always remove your ring when doing something potentially damaging. When in doubt, take it off - just be sure to designate safe storage spaces both home and on-the-go. As for the maintenance tasks like cleaning, inspections and appraisals, try setting yourself recurring calendar reminders. If your jewelry is insured, your annual renewal is a great reminder to take that ring in for an inspection!